So, yes, I went to see Van Halen last night, and the quick and dirty verdict is that they've still got it, and Wolfie held his own but Michael Anthony was missed. But before I get into what happened last night in Greensboro, let me take a trip down memory lane, because, when you get right down to it, classic rock is just oldies music for Boomers and older Gen-X'ers such as myself. What better way to start a review of an oldies act than with a look back at youth. 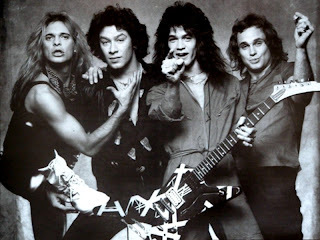 I saw Van Halen when I was 13 on the Women and Children First tour at Hampton Coliseum in Hampton, Va. That revelation always elicits a "wow" from the VH fans I know, most of whom saw them either on the 1984 tour or during the dark Van Hagar years. It was in August, and I had gone to Busch Gardens with my mom, our neighbor Miss Margaret, and Miss Margaret's teenage daughter Suzanne. As it turned out, the hotel where we stayed was right beside the coliseum, and the show wasn't sold out, so that night, Suzanne and I just walked up, bought tickets and went in. I don't know why I remember this, but the opening band was called Cats. It was general admission, so we ended up getting great seats in the first level up from the floor. I remember Dave's awesome high kicks, and thinking that Eddie seemed a little out of it because he kept turning his back on the audience. I also remember the smoke was so thick in there that we could barely see the beach balls that people kept batting back and forth. And I remember the crowd being a sea of denim and hair. But one of the many big "D'oh!" moments in my rock life is that I was supposed to see them two years earlier opening for Boston with Poco and The Outlaws at Carter-Finley Stadium, but couldn't go because I came down with mononucleosis. Three school friends of mine, Pat, Herb and Louise (all real names) went with Louise's older sister driving. That could have been my first rock 'n' roll road trip, but instead I was sick in bed with a stupid infectious disease! After the show, they couldn't stop talking about the crazy opening band with the swaggering lead singer and lightning-fingered guitarist. They also brought me a T-shirt with the Boston space ship and the words "BOSTON SMOKES RALEIGH!" with Van Halen in small letters on the back. That T-shirt disappeared off of a clothes line a few years later at my aunt's house in Johnston County when I spent the summer there working in tobacco. I had worn it to the tobacco field in hopes of impressing some cute guy. Double "D'oh!" 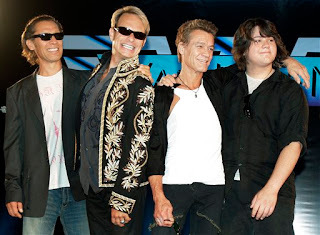 Anyway, the point of all that is that while I have a cool Van Halen memory, my old friends, whom I haven't seen in years, have much cooler memories. Last night's scene was much different than that show I saw at Hampton. The bell bottoms had been replaced by tapered dad jeans, and what little hair was left was topped by baseball caps. And I can honestly say this was the only major rock concert I've ever attended where I did not smell any marijuana smoke. And this time my seats were in the nosebleed section, but thankfully there was a huge screen behind the stage, to prevent us all from having eyestrain. They opened with "You Really Got Me," and followed the same set list from Charlotte. Strangely, half the folks in my group insisted later that they played "D.O.A.," while the other half (including me) insisted that they didn't. Dave seemed to have a few mic troubles during the first song, and there were a couple of times during the show where Alex seemed to lose the beat, but otherwise they were musically on it. Wolfgang Van Halen did an impressive job with the bass, and his and Eddie's backing vocals were good, but Michael Anthony's presence was missed. Dave strolled the "S"-shaped stage, looking age-appropriate rock-starish in leather pants and a series of trim-cut blazers, including a military-style jacket to start off the evening. Eddie looking healthy and trim with close-cropped hair, went shirtless with a pair of white man-pris and some low-top sneakers. Wolfgang wisely stuck to all-black. They played one of my favorite VH songs, "I'm the One," but DIDN'T do the "shooby-do-wah" breakdown -- probably because you really need Michael Anthony to do that. Instead they stopped, and Dave and Eddie hugged each other. They actually wiped tears away from their eyes as the audience roared. Other highlights included "Everybody Wants Some," "Somebody Get Me a Doctor," and "Ain't Talking Bout Love," which had every single person in the coliseum pumping their fists to the "Hey, Hey, Hey" part. Dave began "Ice Cream Man" with a rambling, but touching, story about getting high, shining a black light on a wall where people had been throwing darts, and imagining that the paint chips were stars. Apparently he met someone he lived with for several years while doing this, and "Ice Cream Man" was her favorite song. But there were some definite low-lights, including Alex's drum solo, during which every woman in the coliseum, including yours truly, decided to take a bathroom break. I've never liked the song "Little Guitars," so I decided to take a little catnap (I have the ability to fall asleep anywhere and at any time except at night in bed). I was snoozing pretty nicely too, until Jessica elbowed me to ask me if I was asleep. That's why I can't say for sure if they played "D.O.A." or not. I swear they were still playing "Little Guitars" when I woke up, but I guess it's possible they did some sort of medley in the middle of that song. The other stinker was "Jump," in which Eddie's guitar suddenly began emitting an ear-splitting, atonal wail. The look of disbelief on the faces around me was hilarious. It was so bad, that in the van ride home later, Chris kept going on and on and on about how this was the best concert he'd ever seen, that it was the best concert EVER, but he ended every word of praise with, "except for "Jump." New York's Bridges and Powerlines, a catchy pop group that also includes former Raleighite Keith Sigel, has just finished recording its first CD and will be in Chapel Hill tonight at The Cave. In honor of the group's upcoming shows in the state this week, N&O cartoonist Grey Blackwell, the same guy who did the Coach K spoof and the presidential Law & Order send-up, created a new cartoon lampooning Van Halen. Check it out! According to Pitchfork -- with the Indy's Grayson Currin as contributor -- Megafaun was touring with Akron/Family and Greg Davis, and the bands' vans were apparently all broken into. Read more here. "If you have any talents or better yet a complete lack of talent relating to the music video-making business, please do drop us a line at elenibinge@gmail.com and we can talk camcorders, super-8, or whatever camera language you prefer. If you've seen other videos BB has made, you might understand why we're asking for your help. We'll give you cookies." Get a head start by checking the band out tonight at Duke Coffeehouse with Yeasayer from Brooklyn, and Shapes and Sizes from Montreal. 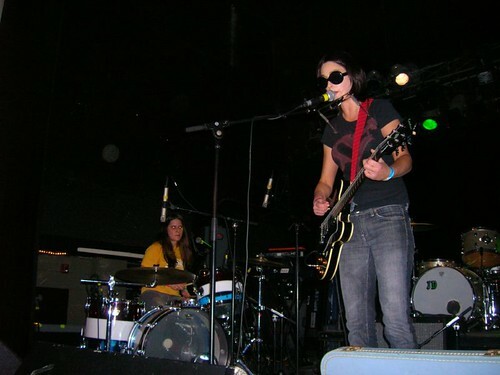 I caught a couple of the bands at Lincoln Theatre last night, Regina Hexaphone and The Moaners. I actually got a short movie of Regina Hexaphone (it was their CD-release party), but later as I was video-ing The Moaners, my memory suddenly died, and I realized I still had some photos and videos from Europe on the card. I was faced with the decision of going back and deleting individual photos, or just wiping everything clean. I opted for the latter. To make up for it, I got two videos of The Moaners, who ought to be a whole lot more famous than they are. I remember seeing Melissa Swingle in the very first incarnation of Trailer Bride, YEARS ago at The Cave. Her songwriting abilities and musicianship have grown over the years, but she hasn't lost any of her swampy, innocent charm. Drummer Laura King has some serious power, and is a good heavy rock foil for Melissa's bluesy tendencies. There were a couple of times when they seemed to be channeling Led Zeppelin. The Moaners from Mann's World on Vimeo. Mann's World around the world! During my recent trip to Europe, I decided to document a couple of the shows I saw over there. First up are two clips from a show on Friday, Sept. 7, at Roadrunner's Paradise, my favorite club in Berlin. The first clip is from an English band called Steranko, whose frontman looked like a punk rock Borat and had a penchant for running around the club wildly. We spoke to him afterward, and he was actually a really nice, cool guy. Next up was Poolstar from Berlin, who reminded me of Green Day, and whose members all wore matching white shirts and ties. Finally, the next Friday, Sept. 14, we saw a French band called the Naive New Beaters at The Rock Cafe in Prague. They were sort of electro-pop with hip-hop tendencies, and a decidedly 1980s sense of style. Seriously, I haven't seen so many raglan-sleeved sweaters in one place since high school. I don't know how popular they actually are in Czech Republic, but there was actually a TV crew there to film them. Contribute to the Mann's World camera fund! After more than two years of taking photos and making movies of local bands, I've decided it's time for me to get a better camera. 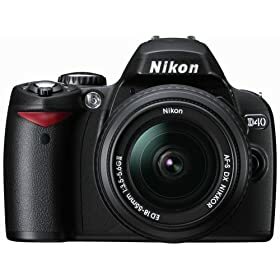 My little Nikon Coolpix has served me well, but it doesn't have the settings I need to take the spectacular band photos I would really like to take. So I'm doing something that makes me really uncomfortable: I'm begging you guys for money. I realized recently that if every band I've ever photographed, and everyone on my Myspace Friends list were to send me $2, I would have more than enough to get a really nice digital SLR camera, either a Nikon D40 or a Canon Rebel. Y'all know I've been writing about local music for a long time, and except for my time at the Indy, I haven't gotten paid for it. I do this because I love it, not because it makes me rich. If I could figure out a good way to make cash from this blog, I would (I've yet to see any real results from adsense). In the meantime, I'm just going to stick my hand out and see what happens. I promise that any cash I get from this will go directly toward buying a camera, which will be used primarily to take pictures of local bands. And I promise that once I get that camera I will make more of an effort to cover goings-on in Chapel Hill and Durham (I know I'm too Raleigh-centric). If I happen to get more than I need, I promise to donate the extra cash to the SPCA of Wake County, a fine organization of which I am already a member. 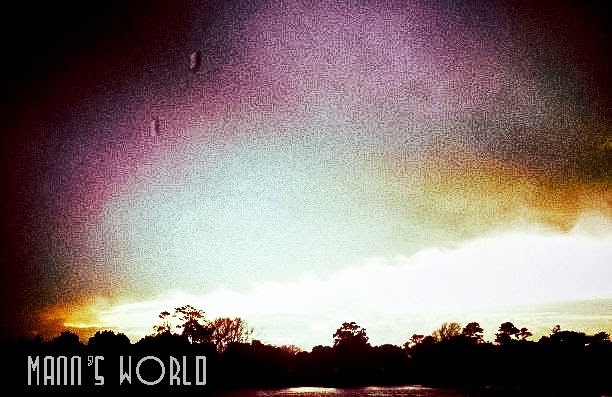 So, please consider donating to the fund, by going to PayPal and sending $2 to mannsworld@gmail.com. You will have my undying appreciation. I'm back from vacation, but was still a little too out of it to make it out to SparkCon's first two nights. But I fully intend to be at Lincoln Theater tonight for the big finale. I admit I'm not that familiar with Apples in Stereo, but this video is pretty catchy. Here's another song, "Can You Feel It." Want to know where I've been the past week? That is, it needs you if you're in a band. This year's fest, sponsored by The Raleigh Hatchet, is set to take place at Hell with The Monologue Bombs, Jews and Catholics and Cantwell, Gomez & Jordan. Think your band can hold its own on that bill? E-mail Music Editor Amanda Becom to let her know. This week Cat's Cradle is hosting two shows I would love to go see -- if I wasn't going to be out of town. You already know about The National (Sept. 7), but you may not be familiar with Midlake, who, honestly, are pretty new to me too. They'll be at the Cradle on Sept. 5. Check them out and let me know what I missed. Check out "Roscoe" by Midlake.